One of the sessions that really excited me was “The Writing is on the Walls! 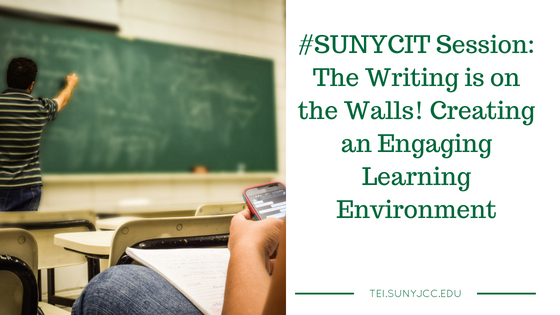 Creating an engaging learning environment” given by Binghamton University. The presenters, James Pitarresi, Associate Vice Provost for Student and Faculty Development/Executive Director, Center for Learning and Teaching; Paula Russell, Associate Director; and Eric Howd, Instructional Designer discussed their new Center for Learning and Teaching. They talked about the vision, technology, implementation, research, and vision forward. The Center for Learning and Teaching came out of a Binghamton University strategic planning process. James Pitarresi was asked to head up the Center for Learning and Teaching. They needed a new vision, one that focused on student success. As a result, they built a teaching lab, where they could experiment. They wanted to create a place where faculty would come to CLT for guidance. They wanted to build a learning community. Classroom technology is now under CTL. They have instructional designers dedicated to helping faculty develop courses. All instructors are considered equal and CLT supports all of them. The team regularly organizes events to show new technologies and methods. Faculty teach 10 courses a year in the new teaching lab. Classroom technology used to work for Information Technology. They created classroom environment to keep people happy; however, it was not research based. This has changed. In the new environment, they wanted to create a space where they did not care if they failed. They wanted a place where they could experiment with technologies. They wanted a place where faculty could try new things. Where they could see what works and what doesn’t. They now had the backing of academic affairs. The result is a 28 student space. It is a working classroom. It is used for actual semester-long courses. In addition to courses, they have open times where people can drop in. Lessons learned in the teaching lab help to refit other classrooms at a reduced cost. it has become faster to refit rooms. The learning studio has an array of different technologies. They have an interior designer, and they also experiment with various furniture. There is no “front” of the classroom; instruction can be presented to any of the walls. Students can also present content from their own mobile devices with wireless technologies. Students are now selecting classes based on this room. The presenters commented on a number of implementation points. The scheduling of the space is based on a number of factors: Try to get instructors from every school, first time instructors, 28 or fewer students, and do they teach multiple sections. If they teach multiple sections, they conduct research with one class in the teaching lab and the other in a traditional classroom. In the future, classrooms will probably be assigned based on pedagogy due to lessons learned in the teaching lab. The executive director decides who teaches in the teaching lab. The instructional designers and other support personnel work as internal consultants. They provide instruction for faculty. Faculty are required to go through an orientation before using the classroom. Instructional designer tries to make all instructors instructional designers. Faculty are also debriefed after they taught in the teaching lab. Support for the classroom is key. Classroom does not have a front. There is no lectern. Orientation for the classroom is based on examination of teaching, not technology. Moveable furniture is a huge success. They are using Herman Miller furniture. Sharing content through wireless devices such as Clickshare is a plus. Everything they do is being researched to include a national study with a furniture vendor. They have IRB research approval. During the first class of the semester, students are introduced to study. They have two surveys (pre and post) that they must complete. They also research classes with multiple sections; one of the classes is a control group. Comments from students have been very positive. Their future plans are to include rooms with with telepresence so they can bring in outside speakers. As I noted above, this presentation excited me. I believe JCC needs a place for faculty and instructional designers to experiment. As the presenters noted, it is a lot more cost effective to experiment with a technology and discover it does not work rather than roll it out to the classrooms.